ST. 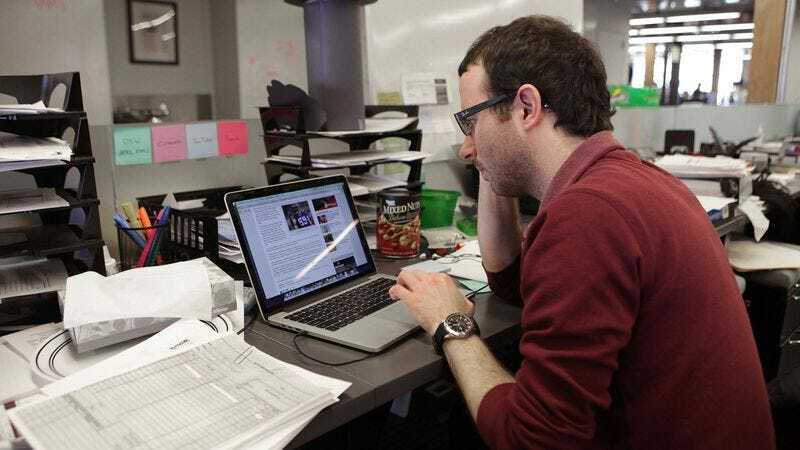 CLOUD, MN—Saying that he was now “paying the price” for his failure to properly pace himself, Talos Analytics junior marketing associate Cameron Gaither, 28, admitted to reporters Wednesday that he had completely exhausted all of his usual time-wasting websites well before lunchtime. “Christ, I’ve already checked all of today’s Gawker posts and everything new on Boing Boing and it’s not even noon yet,” said Gaither, noting that he had additionally “plowed through” the latest updates on Fail Blog, Texts From Last Night, and Bleacher Report, where he typically fritters away his time throughout the course of a full workday. “Man, I’m really running out of ideas here. I’ve even taken another pass at the XKCD archives and burned through just about every subreddit I can think of. What the hell am I supposed to do for the next six hours?” Gaither confirmed that his current dilemma was the worst he’d faced since last week when he got roped into attending a morning sales meeting and consequently had to spend the rest of the day fervently catching up on all of the online time-squandering he’d missed.